So echos from my mother as a kid ring in my head this morning. "We are all going to make mistakes. The only way to make progress is to remember to learn from them. You will never learn anything if you are right all the time." So this was what I posted on my FB page describing the events leading up to what we know now about Joaquin. Because most of the people reading it on my FB page are very new to the weather enthusiast world it is written in a language that everyone should understand. The analogy I use about half way through I give credit to our very own rb on this board. (thanks) Lets cont any further discussion about model runs etc regarding Joaquin here going forward. I will pin this thread for today then after 12z if nothing is changed we will let it dift down into the bowels of the forum. If you have any questions please feel free to ask. So here is the situation regarding Hurricane Joaquin and an explanation why the forecast was the way it was this week. This will be a fairly in depth convo and will be a long read, so if you dont want to read anymore here is the spoiler alert. There is about a 90-95% chance that Joaquin's track takes it out to sea with no major landfall at all along the east coast. I will not update it any more unless drastic changes occur. Now lets look a little more in depth. Image 1A is an image of north america and the atmospheric conditions as of about 6am this morning at about 18,000ft above sea level (AKA 500mb maps; AKA H5 maps). The wind pattern or movement of air at this level is typically used to see the direction that a system like Joaquin will go. The first thing to understand is that as of 3-4days ago not a single weather model had Joaquin develop into a category 4 major hurricane. Initially they had him as a Trop storm or Cat1 hurricane by this time. Thats important because if that were the case by this morning it would have been positioned further north and west than it currently is. Ill explain why thats important in a minute. Now look at image 1B. Same time frame as 1A. As of this morning you have two counterclockwise spinning areas of low pressure(LP) influencing Joaquin, one to the north west over the US and one to the north east over the Atlantic. 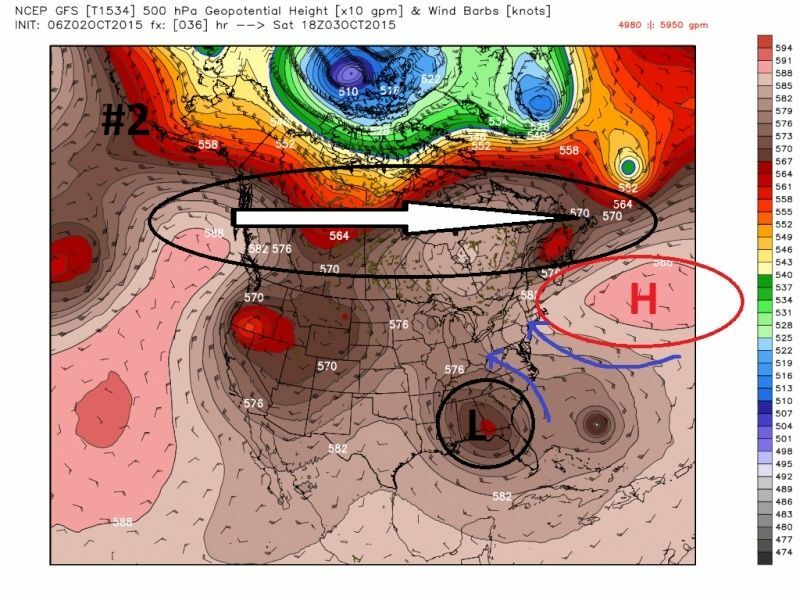 In addition an area of high pressure(HP) with clockwise winds is building into a "block" NE of new England. The blue arrows indicate the direction of wind. If Joaquin was a bit further north he would get sucked into that alley and slam into the coast prob creating as bad if not worse conditions than Sandy because it prob would have been a stronger storm at landfall. Pretend Joaquin is like a tennis ball sitting in the center of a mattress and the two areas of LP to the east and west are like two bowling balls that you place on the mattress on either side of the tennis ball. Both bowling balls will create an indentation in the mattress. Depending on how close the tennis ball is to either one will dicate if it rolls towards one vs the other. What models had a tough time seeing is that the LP to the NE over the Atlantic ocean had been tuging on Joaquin holding him back and forcing it further south than originally thought. As a result the center remained over VERY warm waters. As a consequence he rapidly intensified (which models didnt see) going from a tropical storm to a category 3 and now 4 hurricane in less than 36-48hrs. Again not a single model saw such intensification a few days ago. Refer back to image 1B. Notice how the LP to the right has a little black line that wraps around the system indicated by the little yellow arrows. Imagine it like a tenticle. 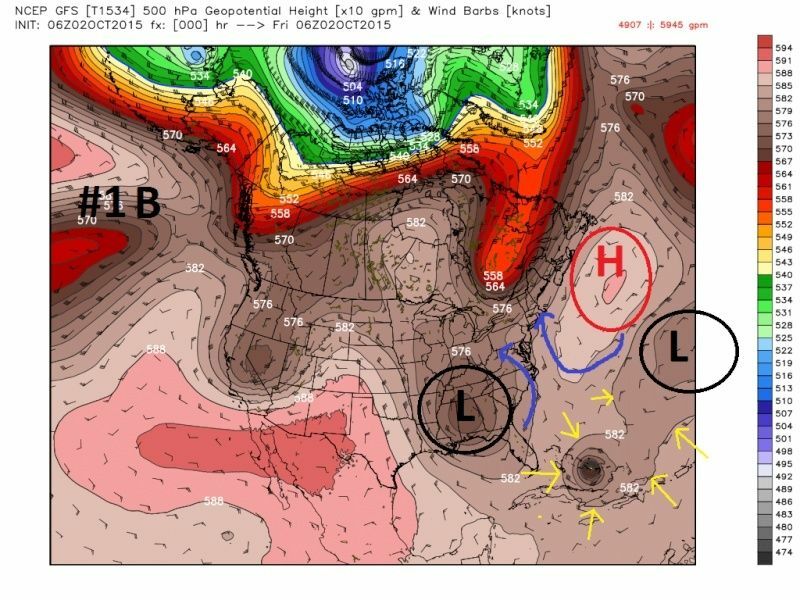 Thats the LP over the Atlantic tugging on Joaquin holding him back ever so slightly; preventing him from being influenced for the moment, by the LP sitting over the US. Now shift to image 2 below. The time frame for this image is Saturday afternoon. As you can see the LP to the east is no longer in the picture and the LP to the west now has now got a tentacle around Joaquin. The HP to the north of the system has strengthened into a formidable block, and the big white arrow up I added over Canada indicates that the entire pattern as a whole is shifting from west to east. Problem here is that by now Joaquin is too far east to be heavily influenced by the LP over the US and pulled into the coast. Again if he was not held back he would have been further west and you see the lane where he would have been sucked into and made landfall. Enter the final image, labled #3. 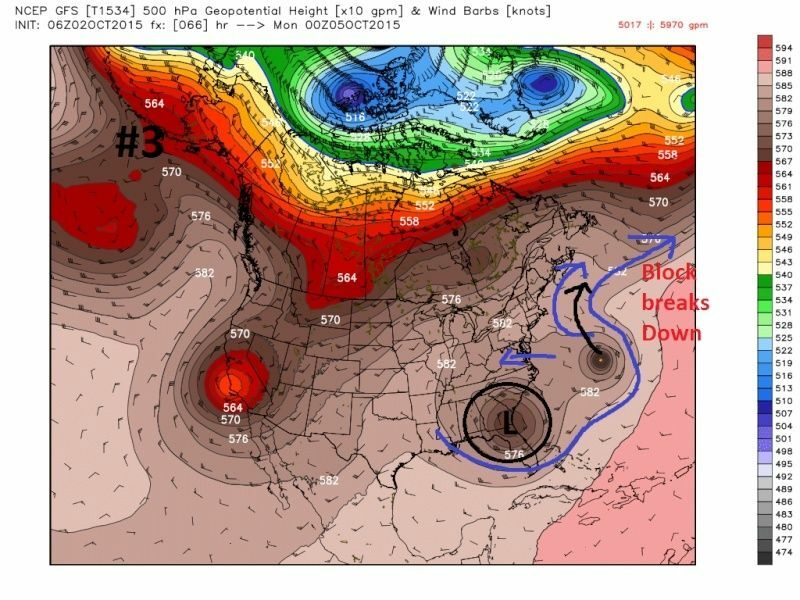 By late Sunday night into early Monday because of the movement of the pattern as a whole from west to east the western edge of the HP block has eroded and shifted east now giving Joaquin an escape route northeast out to sea. The European model was the first one to show this soln. Monday it still had a landfall near North Carolina. On Tuesday and most of Wed EVERY model, with the exception the European model had Joaquin making landfall somewhere on the east coast. With Sandy so fresh in everyones minds and so many models depicting a potential catastrophic outcome it had to be mentioned this week to get people prepared for the worst case scenario. By late Wed and Thurs the other models began shifting towards the out to sea soln, and now most agree its going out to sea. Until Joaquin is above the same latitude as Cape Hatteras North Carolina its not totally over but again an out to sea soln is more than likely at this time.